Sew Inspired: 200th Post Giveaway! I got some fabric the other day. 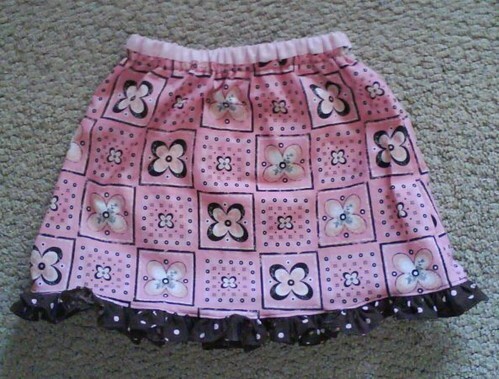 I love this pink Sultry floral print and will make something for my little girl to wear from it. Not sure what I will do with the charm pack yet but I love charm packs. The tag blanket has some ribbon, some wide twill tape, and some bias tape for the tags. I love the colors on this and think it turned out so cute. I made a couple of similar tag blankets a while ago for my girl and my friend Heather's baby and just used one layer of quilt cotton and one layer of baby corduroy. L's seems a little flimsy so for this one I decided to sandwich a layer of flannel in the middle of the two fabric layers to give it some body. that green and lime fabric is beautiful! I love the mini quilt. I'm sewing bits here and there but mostly cooking and blegh mending. That skirt is darling! Congrats on reaching your 200th post! I *just* launched my own blog (this morning!) and I can't wait to see it grow over the years. I'm from Northern California where the weather has been unusually, yet perfectly cool. So, I've been doing some sewing. I just made a blanket doll for my six month old (and posted the tutorial on my blog: www.giftsfromthedivine.blogspot.com). Thanks for all the sewing inspiration! Love the fabric!!! LOVE LOVE LOVE the wrist-let! Awesome! Im sewing on dresses for fall! Im currently reading Seams to me and beautiful skin of color. I cant wait to see the quilt when its finished!!!!! YAY! I really like the quilt in your header too...is it one of yours? I'm Shelley from northern Maine. I'm busy making lotto blocks; this month is warm/cool log cabins. I'm doing a quilt along making an art quilt wallhanging; and I'm always making more baby quilts to have on hand...I've got two at different stages. Soon, it'll be Christmas stuff to start on. I am Michele from Central Maine. To be honest, I am not a crafty person-I wish I was but between not having the time and not being good at it I have kind of given up. I am currently reading the Twilight book everyone has been talking about for the past year or so and I am busy working days for our fuel assistance program getting ready for the winter! Love the mini quilt! that is a amazing little mini quilt. i love that mermaid fabric. I am Leslie, I love in NY and today i was working on a improv piece with wee play scraps! Congrats on 200 posts! Isn't blogging fun! Firstly, congratulations on your 200th post. 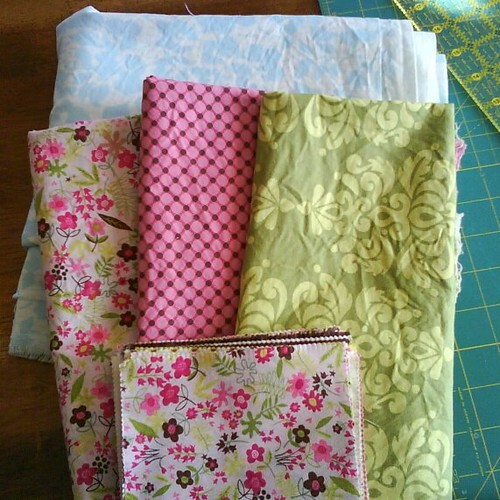 I really love your blog and I cannot wait to try my hand at quilting again. 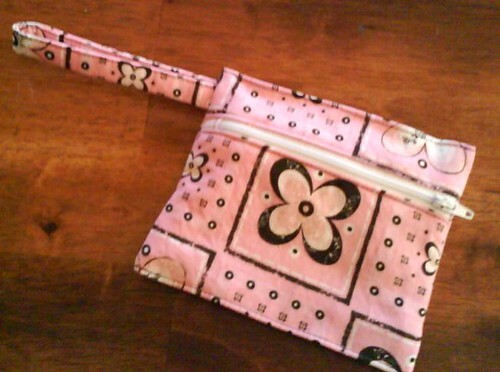 I love the gift you made for your friend and cannot wait to see what you will make for your daughter out of that floral print. Please stop by slipstitches.com anytime. 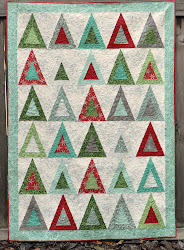 Love all your completed projects and the mini quilt is just gorgeous with those fabric choices. I have been to the beach last week (Isle of Palm, SC) and am going back this weekend with hubby. Our daughter lives in Charleston, SC. I am currently cutting out and will be sewing her a new Birdie bag from Amy Butler's pattern. Congratulations on 200 posts, that is fantastic! 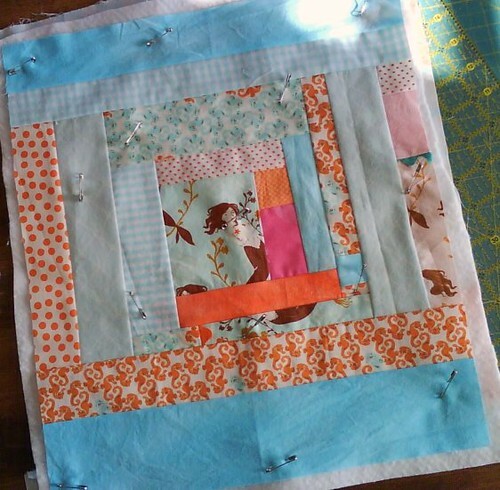 I am Jenny from Fort Wayne Indiana...I am currently making a baby quilt for a close college friend of mine...college days are long gone, but friendship is still there!! Im a scatter brain with reading right now...have started A Single Thread, A Hundred Years of Solidtude (for about the 4th time to try and read this!!) and a sundry of magazines...I read before bed, but lately Ive been asleep before much reading gets done! Thanks for the chance at your mini quilt, it is out of this world! Oh I just love charm packs too! Your giveaway quilt is darling, you are too kind to give it away, thanks for a chance!! My name is Brina from North East Indiana...been a lovely summer here. Im currently making pin cushions for a school fund raiser...and am rel-reading the Anne Rice novels. Congrats on 200 posts! Thanks again. Such gorgeous stuff, Vicki! Beautiful quilt and such a darling skirt. I need to call you... seems forever since we chatted. My cellphone died yesterday though--broke in 2 pieces! I love reading your posts, your are on my Google reader. My name is Cynthia and I live in Florida. I am currently working on many things, finishing a baby quilt for my daughter, working on a paperdoll quilt, binding 3 quilted quilts, and reading? there is only so much time in the day. I guess you could say that I read the computer.... I would love to win the mini quilt! It is beautiful. I don't know if I'm too late, but I just found your site! And I wanted to post anyways because I love all the things you make. 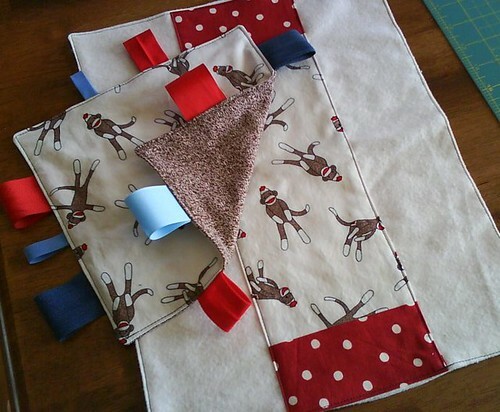 I plan on making a mini I-Spy quilt for my daughter for Christmas. It will be my first ever! I am sew excited! I also dabble in making her cloth diapers and some clothes. You're in my favorites. I've only been blogging for 9 months. wow....lots of pretty things! thanks so much for coming last night...it was great to see you and your family. thanks for the quilts too...the bindings are perfect! and congrats on 200 posts too...i'm so glad we connected through our blogs!